The newest map for PlayerUnknown’s Battlegrounds, Sanhok, released last week, and it’s got a pretty different feel from the previous locations. It’s much smaller, leading to faster, more intense firefights – and that change is very much by design. PUBG Corp has put out a new making of video showing what went into bringing Sanhok to life, interviewing developers on the process. Dave Curd, leader of the game’s Wisconsin-based world team, says that they went through a number of potential locations coming off of Miramar, including the pacific northwest and the Australian outback. Wherever the map would end up, the developers wanted something distinct from the Mexican desert that served as the backdrop for Miramar, which eventually lead them to southeast Asia – also quite a departure from the original map, Erangel. Stay current on all the best battle royale games on PC. 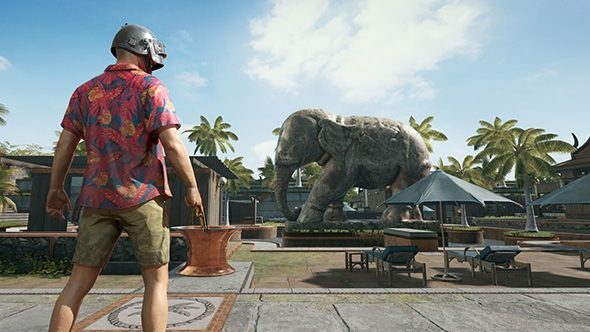 The developers went on location to gather reference material for Sanhok, in an effort to find new ideas and – perhaps – some increased authenticity. Creating the set dressing also used a process called photogrammetry, which involves stitching together dozens of photos into a basic 3D model, which is then refined before inclusion in the game. Of course, the biggest part of what makes the new map such a departure is the pace of play on it – it’s faster and more accessible compared to the expansive previous maps, and the focus on close-quarters combat especially stands out against Miramar. Curd says the team wanted to build something that would be “breath of fresh air after Miramar,” and everything from the setting to more boat-friendly traversal options added to that. Sanhok went out to players much earlier on in development than previous maps, allowing PUBG Corp to get more feedback from regular fans and streamers alike. With that feedback coming earlier in the process, it meant the developers could make more fundamental changes to layouts for specific towns and areas. Erangel did have a similarly open development process, but much of that happened well before PUBG was a hit. It’s a neat peek behind the curtain at what goes into making a battle royale map, and given Sanhok’s generally positive reception it seems that the revised process is working out very well. More new PUBG maps are on the way, with the next set for a wintry theme – and Sanhok certainly paints a positive picture for those upcoming additions.